I have participated in the Grow Your Dough Throwdown 2.0 sponsored by Motif Investing. This challenge is a friendly investing competition among 20 personal finance bloggers. I've learned a lot by competing. In its second year, the contest is the brainchild of Jeff Rose, CFP, and owner of the Good Financial Cents website. Jeff has started a few finance-related movements, such as the Roth IRA movement in which he encouraged bloggers to educate consumers about the unique benefits of this retirement account. 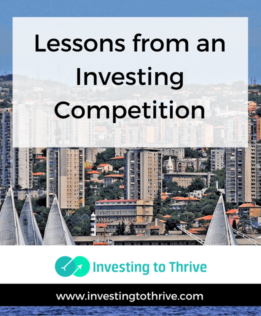 The competition serves as a focal point to encourage investing among blog readers, particularly those who may be sitting on the sidelines, unsure of how to get started and fearful of making a mistake or losing money in the stock market. As this year's sponsor, Motif Investing awarded each blogger $500 to invest in a motif, which must be comprised of at least one and up to 30 stocks or ETFs. We had a few months' notice in which we could contemplate our selections, and then we had to buy our motif between market close on December 31, 2014 and January 2, 2015. Some folks selected a professionally-designed motif and others created their own. I built my motif drawing on my successes from last year's competition in which I screened stocks using an investment newsletter, my own valuation method, and a technique borrowed from last year's winner and most likely this year's champion. My motif has been ranked as high as #3 though it has bounced around from 10th to 14th to 5th, etc. My motif is comprised of stock from companies that make, market, and/or distribute products used nearly everyday. It is called Everyday Buys for Business and Regular People and contains eBay, Starbucks, Apple, Nike, MasterCard, Littlefuse, and Heico (the last two are industrial firms). This mix combines what I believe are robust companies that are growing and/or have undervalued shares. I wrestled with the weighting (percentage assigned to each stock) but finally decided to allow consistent performers to have enough weight to stabilize the motif but not so much to prevent strong returns if my less-capitalized (smaller) companies did well. My best performer was the Natural, Everyday Food motif, which grew about 20%. Combined, my experiments performed decidedly average with the small caps and international funds dragging down overall performance. Still, I learned a lot and feel even more confident now as an investor. Investing pundits may predict market corrections but they can only guess how the entire market or segments of the market (such as the S&P 500) will perform in a given time period. Based on warnings that U.S. large caps might experience a market correction and the general idea surrounding asset allocation and diversification (small-cap and international equities often move in different directions than U.S. large caps), I bought small-cap and international mutual funds hoping to outperform the S&P 500 in 2014. However, my fund picks ended up losing in value while the S&P 500 experienced double-digit growth. Since then, I have realized that there's a difference between a prediction and an observation. A savvy adviser may suggest that the the U.S. stock market, European market, etc. is under- or overvalued, note that undervalued stocks tend to rise in value and overvalued ones often stagnate and decline, and offer insights on appropriate actions. But the smart and experienced ones typically won't predict the timing of market movements. Investment fees can wreck investment returns. I've written about investment fees, naming their various types and providing tips on how to minimize these expenses. But often when I consider fees, I think about them abstractly, more as an evil force out in the world but not necessarily an enemy to be confronted and defeated. But my results with Betterment taught me how to deal more directly with the problem of investment fees. I learned that the firm's approach works well but (under the former arrangement) I should either set up an automatic deposit of $100 (or more) or invest a lump sum of $10,000 (or more) to pay low fees associated with its assets under management (AUM) pricing model. During this time, I paid $3 per month, which eroded my return on a $1,000 investment. For example, if I invested a flat $1,200, I'd pay $36 each year in management fees (I don't pay transaction fees on trades that Betterment makes on my behalf). However, if I invest $100 per month via the firm's auto-deposit (for a total of $1,200), I'll pay 0.35% of AUM, which totals about $4 per year. The firm allows me to invest any amount but the pricing model made more sense with automatic deposits or higher minimums. By the way, in terms of market performance, many of last year's participants would have done better to invest with Betterment. Update: Betterment has updated its pricing, eliminated the monthly fee, and now charges 0.25% AUM for its basic services. Having to buy stocks within a certain time frame makes buying at the right price difficult. One of the difficulties of the challenge was having to buy motifs according to a strict deadline. Unfortunately, when we executed our purchases at the beginning of the year, many share prices were at an all-time high. So, an element of this contest, at least for me, was to develop a list of potential buys for my motif and only purchase those that were priced at an acceptable level in a two-day period. Now, when prices fell, I could have rebalanced my motif and grabbed low-priced stocks but I would have to pay a $9.95 fee, which I feared could erase much of my returns. Contrast the investing challenge to a more commonplace investing environment: I can set a price and only buy when I'm ready. Typically, if I'm going to buy an individual stock or build a position in an individual stock, I'll do one of two things: 1) establish a price I'm willing to pay for shares and buy at that price or below; or 2) purchase shares over a period of time, so that I accumulate shares at various prices (both high and low) and my average cost-per-share is not inflated. Generally I'll earn higher returns if I don't rush to buy stocks but rather wait until the time and price is right. Speaking of determining the right price to pay for a stock, calculating the value of a rapidly growing company is extremely difficult. Even if I project the right value, the market may vehemently disagree (which is likely when dealing with a company with just a few years of financial statements available for public scrutiny) and I'll lose money or fall behind in my investing competition. For example, I bought LinkedIn at $208 last year and watched as the stock tanked to $142 (yikes!) before recovering by year-end to $229. (Read about this ride in my article on How and Why I Held Onto a Tanking Stock at Wise Bread. Note that the price has since risen to $265. )In the case with LinkedIn, I could reasonably claim that I bought at the right price but the market was confused about its value temporarily. Still, growth companies are often overvalued. Even though such companies may have excellent prospects for growth and stability in the future, the current price may reflect all these possibilities already. As another example, I am really excited about 3D Systems Corporation (DDD) and its potential for playing a role in manufacturing and economic growth; in fact, I own shares of DDD. But sadly, I paid too much for them and haven't seen a gain. So, it hasn't surprised me that Motif Investing's 3D Printing Stocks motif has been one of the worst performers in the challenge so far. Some can use stock signals for big wins, if you don't mind taking big risks. Competitor Philip Taylor of PT Money has employed a stock signals strategy that has far surpassed nearly all of the participating bloggers. Philip was the champion of the first Grow Your Dough Throwdown. And, as of this writing (less than three months into the new year), the return of his motif is 125% (wow! ).Philip cautions investors not to use this technique for the bulk of their investing dollars as the strategy is considered speculative. In fact, his very first selection in 2014 fell initially; but he soon recovered and traded more to end the year with a 33% return. I consulted the stock signals chart to narrow and confirm a couple of selections in 2015.My goal is to learn more about these indicators and how to effectively integrate this information into a stock buying regimen. My current understanding is that the chart identifies signals that indicate a stock's rising popularity; investors can then “ride the wave” as Philip describes by purchasing shares on the way to continued price increases. It's okay to buy what I like and avoid what I don't like. When screening stocks, one factor that I consider is whether I personally like (or dislike) the company or its industry. I have come to realize that it's okay to make a decision based on personal preferences. Not always, but often, my preference is driven by a positive customer experience and such experiences indicate a solid management team, well-run operations, and sustainable business model, all elements of a long-term successful business. For example, the natural, everyday food companies that I chose for my motif in 2014 included Chipotle and Panera Bread, a couple of fast-serve restaurants that I enjoy and occasionally frequent. The motif also included Annie's Natural Foods, a favorite of my sons. Coupled with investment letter recommendations and appropriate valuations, I figured these stocks made good picks. At the same time, I have learned that it's perfectly fine not to buy companies that engage in practices that I don't admire. This year, I avoided investing in oil-related companies and passed up the opportunity for large gains. So far, this move has positioned me favorably though that could easily change by the end of the year. Still, I am happy to avoid these stocks and don't mind missing potential gains so that my investments can more aptly reflect my values. By far the biggest lesson I've learned is that I should document (or commit to memory) the reasons I've chosen a particular stock, ETF, mutual fund, etc. whether a tip from a buddy, recommendation of an adviser, thorough evaluation of a company's value compared to its stock price, or a combination of these. Then, I can consider what technique consistently delivers the strongest returns and keep doing more of what works and less of what doesn't. The more I pay attention, the more I've learned. What have you learned from your investing successes and failures?